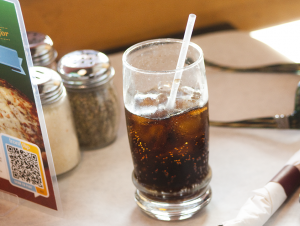 The brown coloring in your soda may be linked to increased cancer risk, according to a new study. A 2013 study looked at the amount of 4-MEI in colas and sodas, and found that of the 110 drinks tested, the average amount of 4-MEI in the beverages was between 3.4 and 352.4 micrograms per 12-ounce soda. There are no limits for the amount of 4-MEI legally allowed in a soda, but there are laws requiring sodas sold in California to have a cancer warning label if a soda contains more than 29 micrograms of 4-MEI. The recent study, published Wednesday in the scientific journal PLOS ONE, was a follow-up to find how much soda is consumed by 6- to 64-year-olds, and thus estimate the risk of cancer from consumption. The average amount of soda ingested per person per day was found to range between one 12-ounce soda to 2.5 cans, and the age group with the largest consumption, 16- to 44-year-olds, averaged about three cans per day. While soda is not the only food 4-MEI is found in, it is one of the biggest sources. In all, the study claims that, in the next 70 years, there could potentially be between 76 and 5,000 cases of cancer in the U.S. caused by 4-MEI exposure alone.